Bad food, open bar (great!) but terrible drinks, and watching the clock until it's time to leave. Is there an upside? Let's find out! We’ve heard the horror stories about drunken debacles leading to uncomfortable moments back at the office. This definitely happens at company holiday parties, but probably more often is the simple fact that they’re generally a snooze. Bad food, open bar (great!) but terrible drinks (ugh!) and you watching the clock until it seems like it’s acceptable for you to say your goodbyes. Why are holiday parties good? They’re a great chance to build relationships and goodwill with all of your co-workers. For at least one day out of the year, you are commanded to have fun and to talk about something other than work. The goodwill created from the party will continue – at least for a short period of time – back in the workplace, and that only helps to ensure people enjoy coming to work and also work better together. Use the event to actually mingle with people in the company that you don’t usually work with. Particularly those you pass by every day and maybe not even say hello to. Go with the intention of talking to at least 3 people you don’t ordinarily get the chance to hang out with. Really “show up.” Be present. Put your phone away. Not only is staring into your phone rude, but in the context of a holiday party, people will probably assume you are working – and that’s the one time of the year where that’s not seen as a good thing. Keep your drinking in check. Are you a lightweight? Then, this is not the time to get into a shot-taking contest. Are you a drinker who can “hold your own?” This is STILL not the time to get into a shot-taking contest. Be approachable. Smile, shake hands, ask people questions about themselves. If you seem miserable and generally unhappy to be there, people will remember that when they get back to the office. Don’t talk shop. This is probably the most difficult rule to follow. Shop talk is the only talk you have with these people on all of the other days, so it’s understandable that it’s difficult to turn it off. But, talking shop at the party only conveys to others that you are either shallow (“doesn’t he ever talk about anything else?”) or a brown-noser (“look at him, trying to impress the boss with shop talk…what a [censored]”). Don’t drink too much. Yup, the bar may be “open” but your mouth should close at some point. Don’t kiss anyone on the lips. Awkward! Don’t tell someone how hot they look (either male or female). Not matter how much either you has had to drink. Don’t ask someone out on a date. This isn’t the time or the place. 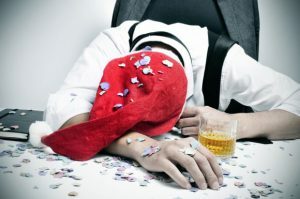 Do you have horror stories of holiday parties? Let’s hear ‘em! Leave us a voicemail at 646-653-9278 or send us a message here.